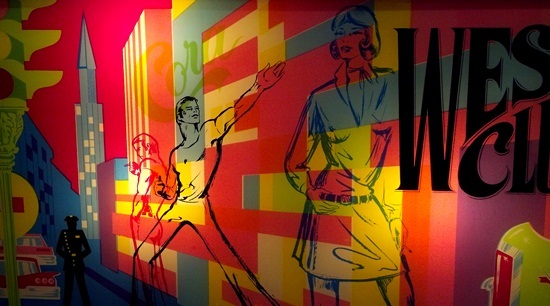 West Club is a truly unique game: a sleek, glamorous snap shot of retro French pop art and pinball culture from 1967. Chances are, you haven’t played one that looks or feels like this one before. This is a real pinball treasure as you’ll soon see. I first ran into West Club at the 2012 Pacific Pinball Exposition and the artwork and odd cabinet design immediately drew me to it. 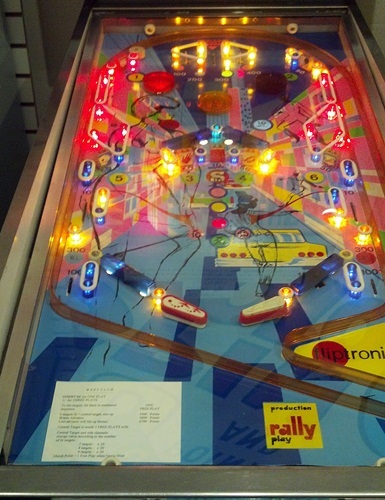 West Club was made by a French Pinball Manufacturer called Rally that existed until 1969. Some of you technical pinball wizards out there might be thinking I got my dates wrong, because yes, those are not score reels. Those are “digit displays”! 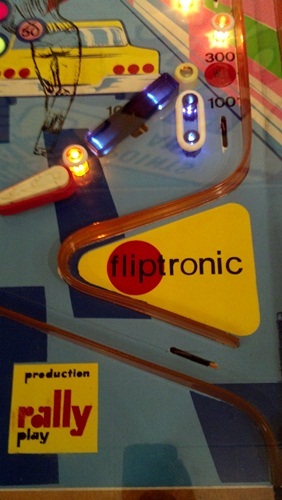 The playfield continues with the flowing art, minimalist design and molded, color-tinted plastics. There’s no apron. The flippers are unique in size: somewhere between the standard long and short flipper in length of mid-70s US Pins. The flippers have plenty of snap and are very responsive. The stand-up targets are thick and beefy. The pop bumpers and “sling” bumbers on West Club are unique. My first thought when describing them is “analog”, because unlike all other pops and slings, the harder the ball hits them, the harder they push back. It makes for odd but immediately intuitive play. West Club also has extremely primitive electronic audio. Again, this was back when bells and chimes were the norm, and would be for nearly ten more years on mainstream US games! 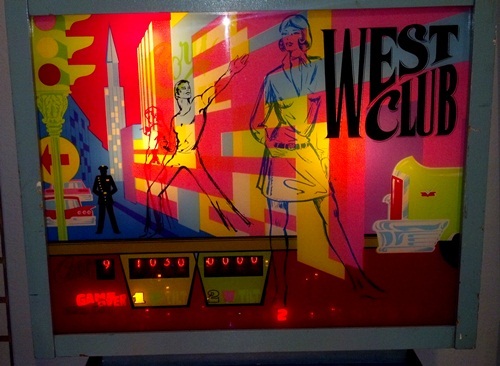 West Club was donated to the Pinball Museum by Jim Deitrich and restored by Dan Kramer. It’s really a fun player and surprisingly easy for this era of game. Check it out!